The Heil Tri Mount allows you to mount up to three mics on one mic mount (such as the PL2 or SB1). This is of special interest to folks running one more than one rig and for contest stations. 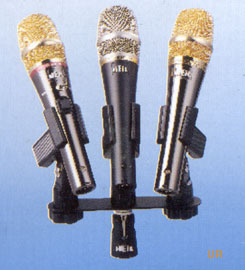 The microphones and mic holders shown are not included. Copyright 2003-2017 Universal Radio, Inc.